Happy New Year everyone! We definitely hope to start this year off with a fresh start!! We have had a busy two weeks since Steph's final treatment on Dec 21. On the 20th we had contingent of Steph's family from Panama arrive in the US and come down to Houston. After coming to her appointment (with all of us making quite a scene in the waiting room), we did some sight-seeing in our host city of the past 11 weeks, including going to Galveston and NASA. Eradication of the adenoid cystic carcinoma, to never be seen or heard of again!! Hello everyone. Well, we are nearing the end! Steph has three more treatments next Monday, Tuesday and Wednesday, and then we won't be back to Houston until February for her next check-up and MRI. She is doing amazingly well, and the doctors seem pretty impressed with her resiliency. It looks like she is going to make it through this with no medication, or any of the other nasty side-effects we were warned about. Thank you for all of your many prayers and support! Steph is doing pretty well, albeit tired most of the time. She has a might-fine tan/burn on her neck, and is getting more adjusted to the dental routine. Over the past month she has had some eye-twitching on her radiated side of the face which--although the doctors don't seem to have any concerns--she does wonder if it is related. She has not regained full movement of her lip (resulting from the original surgery) and her doctor has lost some optimism that it will return to full functionality. Please pray for: 1) Healing of he neck/skin area 2) Energy 3) Recovery of her facial nerve 4) No impact of the twitching eye 5) Our kids to adjust to us being home!! Next Wednesday and Thursday we will have Steph's extended family from Panama in Houston with us and we will be doing some celebrating!! Well, it has been a while since our last email… and things have been progressing very well--thank you all for your prayers! Last week Stephanie passed the huge milestone of being half-way complete with her treatments, and by the end of this week she will have only single digits left!!! Steph still feels good and has not had to take any prescriptions for nausea or pain--which was expected by this point. In fact, today when we met with the radiation oncologist for her weekly check-up we were very encouraged because he said that based on where she is now he doesn't expect her to have any significantly increasing side effects!! So far, she has lost hair around the localized area of the radiation, and has discoloration/burning of her skin (of course in Steph's case it is just a nice tan!). In addition to the loss of saliva/dry mouth, her taste has changed and she has a constant metalic-ish "flavor" in her mouth. A ongoing low-grade nausea also persists. She is learning to manage her reduced saliva though ice chips and constant drinking and some over the counter acid reducers. And maybe her most prevalent activity is her daily and ever-present dental hygiene routine--most of which will continue in perpetuity. In general, I would say that the kids are doing amazingly well--although they are starting to have a hard time when we leave (and so are we). In fact, it was hard enough last night that we decided to stay in Dallas for dinner, take them to bed and stay the night… we then got up at 3:30am to drive to Houston this morning!!! So it has been a long day already:-) We did find out this morning that Steph will be able to double-up one day next week so that she can come home for the kids' Christmas program at school. We were quite excited about that!! There never seems to be enough time when we're home, but this weekend we were able to go to get a lot done, including putting up Christmas lights outside, running errands, going to various parties, and getting to church to be re-charged spiritually and emotionally with our many friends. Thank you all so much for your support in so many ways--both big and small--for acts of kindness we know about and those we don't. And as always, thank you so much to the Farris family for letting us stay with them!!!! Permanent eradication of this cancer!! Hi everyone and Happy Thanksgiving. It has been a while since our last update with the pictures, so we wanted to touch base. We (and especially Stephanie) have been doing lots of driving this past week--and not just due to the holidays. Last Saturday my grandfather passed away, having dealt with various health issues the past few years. In fact he had just started radiation treatment himself for his newly diagnosed esophageal cancer. So after all four of us went to Houston for Steph's treatments on Monday and Tuesday, we drove back across the state to Wichita Falls, Texas for his funeral on Wednesday. 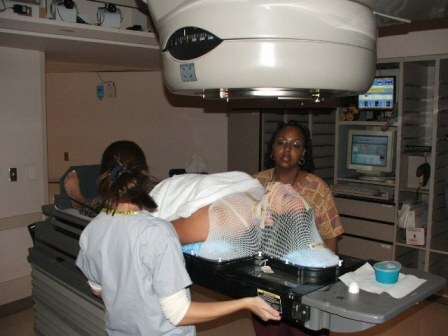 Steph actually doubled-up her radiation on Monday so she could go to the service. We all drove back home Wednesday (it was our first Wednesday at home in six weeks) and had Thanksgiving in town on Thursday with our family. If that wasn't enough of the Texas highways, a friend drove Steph back down to Houston Thanksgiving night for her treatment on Friday and drove back to Dallas Friday afternoon --all to go back again Sunday for a whole week! So, as of yesterday, Stephanie has completed 12 treatments--with 18 more to go. So far she has been doing pretty good, and she knows she is getting farther along as some of the side effects are beginning to present themselves. With her salivary glands being destroyed her mouth is getting very dry and she needs to continually be drinking water or eating ice chips. At night she uses a humidifier. Steph also has been dealing with nausea, which is suspected to be a result of the lack of saliva decreasing the ph in her stomach. She is also starting to have some sores in her mouth and throat and there is some slight burning/discoloration beginning on her skin. Some definite good news is that it seems she is getting into more of a routine with the treatment itself, and the mask is not as traumatic. Please pray for no more nausea, and that her other salivary glands will begin to compensate for the reduction in saliva (which will be permanent). Other prayers are for minimal pain and side effects and perseverance to get through the next three and a half weeks. The kids are doing well, and from here on out we should all be in a more consistent routine. Thank you all for your prayers, thoughts, encouragement, meals, and gifts. They have meant so much to all of us--especially Stephanie. You can see in the photos the mouthpiece to protect her tongue, the mask that holds her head in place, the straps that pin her shoulders and arms down, and of course the large IMRT radiation machine. But most of all, you can all see why she has a bit of anxiety each morning!! We have a great time this weekend for our anniversary (12 years!) and with our many friends for prayer and support. She had her first follow-up doctors appointment today with the radiation oncologist, and everything is progressing well. Stephanie had her first full radiation treatment today and it went very well. As expected, she felt nothing and has no side effects at this point. The process took about 20-25 minutes for them to administer the seven radiation fields (basically seven angles of the radiation gun). She can hear each one, and counts down from 7 to 0. They also have a CD player in the room, so that was comforting. For the next couple weeks there should be very little in the ways of updates--so truly, no news is good news. We will update everyone when something changes, but at this time just keep Stephanie in your prayers. This week her treatments are at noon, but starting next week they will always be at 9:00CST each weekday morning. Thank you for all of the many thoughts and prayers you all have given us. A quick update on Stephanie…. Today Steph had her first treatment--actually it was a "mock" treatment simulation going through everything except the actual radiation itself--and it went really well. She had her acrylic stent for her mouth (versus the wax prototype), and it was much more comfortable--as they were able to make some adjustments. She did have a little anxiety, but it was manageable and she did not require any medication. Tomorrow she has her first real radiation treatment, and she seems in good spirits and has peace about the situation. Please pray for a continued peace tomorrow, especially for me since I am not there. (Her mother is with her this week, but I wish I was able to be there.) Neither of us were with the kids today, and it is Bryson's birthday today… can you believe it--5 years old!?!? When I spoke with him and Brianna on the phone today, they both were doing well with our dear friends the Lowreys. Yesterday and today were positive and productive days as we moved forward on Steph's radiation plan. We also reviewed the test results from last week with the doctors and everything looks clear--and there was no mentions of the preliminary nodule they had found in her lungs. Praise the Lord! Steph picked up her custom stent/mouthpiece on Monday morning and went down to the radiation center for a simultaneous CT scan of her head and simulation for the radiation. The process of creating the full facial mold was quite confining and brought on a little anxiety from Steph:-) Additionally, Steph game to a decision and selected both her oncologist as well as the specific treatment option (IMRT). This morning--along with her radiation "pledge class" (all the other folks who are all beginning their treatments next week)--we had a briefing session with the nursing staff. It was here that we learned all about the "gory details" of what to expect throughout radiation. Beyond her permanent oral hygiene concerns, we found out how important it will be for her to maintain weight throughout treatment, stay hydrated, treat her pain management and nausea, and moisturize her skin. After that side effects briefing, we met with the staff of radiation oncologists who reviewed Stephanie's case to make some fine tuning to her treatment plan. There was some comfort in overhearing one of the senior oncologists say that her case was "pretty straightforward". The physicians then convened for their planning conference and put together her specific schedule. She will be having her treatments at 9:00am each weekday through December 21 starting next Tuesday. Stephanie's anxiety to be eased and her daily radiation sessions to not be claustrophobic or confining. And of course, that the radiation to be effective to prevent any recurrence in the treatment area--with minimal long-term side effects. Please feel free to forward this to anyone that you feel would be interested. 2) If you use a browser to read your email you may have problems with the link above. If so, you can simply send an email to imailsrv@IC-Internal.org and type EXACTLY "Subscribe StephanieUpdate New subscriber" in the body of the email. 3) If that is too confusing or you have other problems, you can always send me an email directly to jason@byrdfamily.org and I will add you myself. Tuesday Steph had an MRI of her head, CT scan of chest, a dentist appointment (the clear her for the radiation), and we met with another radiation oncologist. All in all we spend over 12 hours in the hospital that day. Wednesday she had another dentist appointment to get a stint made for her mouth which will protect her tongue during radiation. We also learned more about the dental effects of the radiation…. Due to the permanent decrease in her saliva, she will have a strict daily oral regimen for the rest of her life including a fluoride treatment every night for 10 minutes. There are other procedures which were news to us, but they are important because she can't ever afford to have any major dental issues. On Friday we were back in Dallas and met with a third radiation oncologist. He was very helpful to clarify the different types of radiation that had been recommended by the two different oncologist at MD Anderson and give his opinion on how he would treat Stephanie. However, given the difference in experience with AdCC--this particular rare kind of cancer--Stephanie has decided to proceed with an integrated treatment approach in Houston at MD Anderson. This is a very important one-shot procedure to radiate this localized area. On Monday we will be back in Houston where she will be getting a head mold/mask and CT scans of her head made--both for the radiation. The MD Anderson staff will be doing a simulation and planning of her treatment, and then Tuesday Stephanie's case will be presented to the nine head and neck radiation oncologists in their bi-weekly "planning conference" to determine and confirm the best treatment approach for her. We should also receive the "official" results of all of the testing from this week. If everything turns out like we pray it will, she should start her everyday (weekday) radiation treatments in Houston the following week of Nov 7, on Monday or Tuesday. As my dad mentioned, we have some very generous friends 2 miles from the medical center that have offered to house us while Stephanie is there. We do not know all of the other logistic specifics yet, but we have many friends and family that have offered to help out with the kids here in Dallas. We will send more updates probably after we hear confirmation of the test results, and then after we have the game plan for her treatment. Thanks so much, and please keep us in your prayers! In a nutshell, this is a slow-growing yet long-term type of cancer (its slow growth is the reason why chemotherapy is not an option). We are hopeful in her immediate prognosis, but we are hunkering down--optimistically--for the long hall. We are still in a "diagnostic mode" right now trying to determine the best course of treatment. We are doing well and have a great support group to take care of us and our kids, but feel free to keep us in your prayers!! Stephanie is doing a great job of turning this over to Lord. For those who are interested in receiving updates as we move through this journey, my dad has set up a listserv (distribution list) to send out emails to our friends and family. If you want to keep getting updates, you can simply subscribe by clicking on the following link (one time), in order to send an email to the listserv mailto:imailsrv@IC-Internal.org?body=Subscribe%20StephanieUpdate%20New%20subscriber. Please feel free to forward this on to anyone you think might be interested. Stephanie, Jason and Myra have been in Houston all day at M.D. Anderson. I talked to them several times and they are very encouraged to find such a great place and such great people. The head of the department has taken Steph as his patient. He does not recommend any surgery without evidence of cells that need to be removed. They are anticipating radiation therapy, but some weeks from now. They will go back next week for a few more tests and to develop their plan of attack. BTW, if you know someone who might want to get updates, the paragraph below tells how to sign up. Our sweet Stephanie, our daughter-in-love, and wonderful mom to 2 of our grandchildren was diagnosed with cancer last week. Only 34 years old and a major battle lies ahead. She is strong and is trusting the Lord (as she has done all her life).